I met Jurate Luckaite and her sister Violet Luckaite at the LA Fashion Weekend Wrap Party back in November. I complimented them on their beautiful clothing and was impressed when they told me they designed it. Of course I had to find out more. These two talented sisters create one-of-a-kind artistic clothing under the Violet Luck moniker. Their luxurious, hand painted silk masterpieces can be worn or enjoyed as framed wall art. BM: How did you get your start in Fashion? For as long as I remember I always had a desire to be in a world of high end fashion. I was always wearing unique pieces, always stood out with my style, could put colors and clothes together in no time, and eventually became a fashion stylist and a makeup artist while my sister was always into arts. 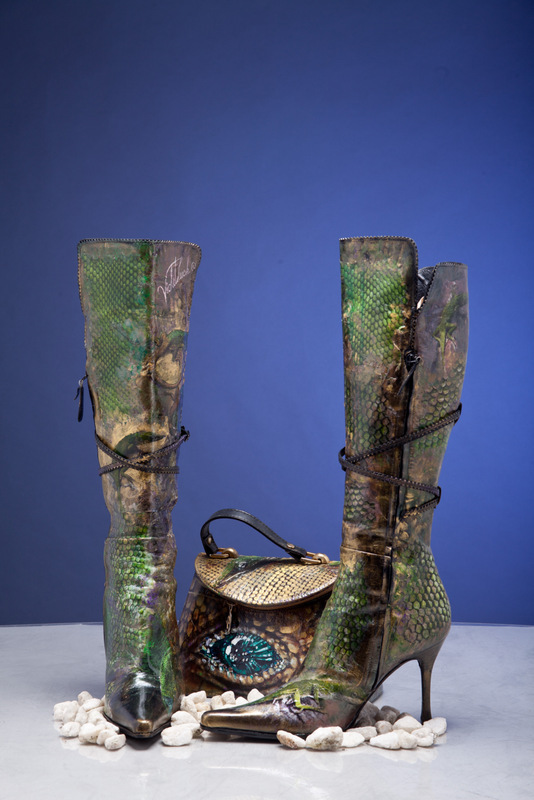 However, everything started with a decoupaged hand bag, a hand painted silk scarf, and hand painted boots that my talented sister Violet created for my 30th birthday. BM: How did you come up with the name for your line? We wanted to use the word “luck” because it is a part of our last name “Luck’aite” and then started looking for a word that goes perfectly together with it. Then the word “Violet” came up, which has a very deep meaning and also is my sister’s name. She is an artist and creator of these unique master pieces. Violet is the color of purpose and is associated with the Crown Chakra that symbolizes a universal connection. More importantly, violet is the color of divinity and it represents royalty, purity, and charm. The color violet also symbolizes harmony of the universe and the planets because of the combination of Yin and Yang. On the other hand, violet as a noun has another meaning. A violet flower is a symbol of beauty and is considered “a good luck gift to a woman.” By combining all the meanings we have created “Violet Luck”. BM: Where do you get your design inspirations? Our inspirations come through visions, dreams, and through nature. We are constantly creating in our heads and in our hearts, so every single piece comes from our hearts, pure intention, love, and passion. BM: How do you take your design from an initial idea to finished product? The idea comes to us of what to put on the silk and usually we don’t even know what the end result will be. Sometimes it becomes totally different than what we had envisioned because we hand paint on the silk only and the silk is the material that is alive - having its own energy vibrations means that we listen to the silk, watch it, and paint accordingly. When we have a vision of what to paint we stretch the silk on the frame and then it depends on how complex the designs are. Some pieces can take up to two to three weeks to complete. Sometimes we have to take the silk off the frame, fix the colors, wash it, and stretch it back on to continue with a different technique. It is like creating a painting; however, we’re working with material that is alive and is way more difficult, especially when you want to paint a detailed face of a woman. After the painting is created we sign it, take it off the frame, fix the colors, wash it again, and stretch another piece of silk, which is the back of the dress. One dress basically consists of two paintings. After the back is completed we hand sew each garment. BM: What is your design philosophy? Our design philosophy is to create art that can be draped over a woman’s body as a painting; thus, making her feel feminine, unique, beautiful, and elegant. Each design that we create is unique, one of a kind and there is no other piece that looks the same. Each masterpiece reflects love, purity, beauty, femininity, and sensual flow. BM: Describe the type of person who wears your creations? Our woman loves life and knows how to enjoy it. She is always dressed up and loves big accents on everything - including jewelry, shoes, bags, clothes…. She prefers unique pieces and doesn’t blend in with the crowd. She doesn’t care about spending money; in fact, she likes to treat herself to amazing things that make her happy. She adores luxury, a good quality life and also enjoys going out and meeting people. She loves exclusive everything…vacations, traveling, wine, dining, spas, shopping, etc. Our customer is someone who is very exclusive, who loves art and fashion, always dresses up, smells good, gets lots of attention, carries a very strong feminine energy, and lives in the moment. BM: What is it like being sisters and co-workers and designing this line together? It is the most incredible harmonic synergy that I could ever imagine. We are so complete and creative when we are together. Violet Luck wouldn’t be possible without us being together. We have the most incredible relationship, and I think God put us together for a big reason because only together we can create miracles. BM: How would you each describe the other’s style? My style is very elegant and unique. I like to express my femininity and sexuality. All I wear is our designs because there is nothing more unique in my eyes existing in the world. I adore what my sister creates and with the biggest respect and happiness I wrap my body with her luxurious silk masterpieces feeling all the love that she puts in them. Violet has a very different style because she is a true artist. Usually she wears loose, baggy long clothes. She has this bohemian style. BM How do you define Fashion? Fashion is the style and beauty of the individual. It is the femininity in a woman—accentuating her beauty—and the masculinity in a man. Each of us is a unique, beautiful individual and labels or brands do not make us look better or more significant. BM: What do you think is the most important trait of a fashion designer? The most important trait of a fashion designer, we believe, is good taste, creativity, clear vision, and drive. BM: What sets Violet Luck apart from other fashion lines? We create an art - a painting on a woman’s body that any body type can wear. Each silk garment is unique, hand painted, and very different from what you see in the fashion world. 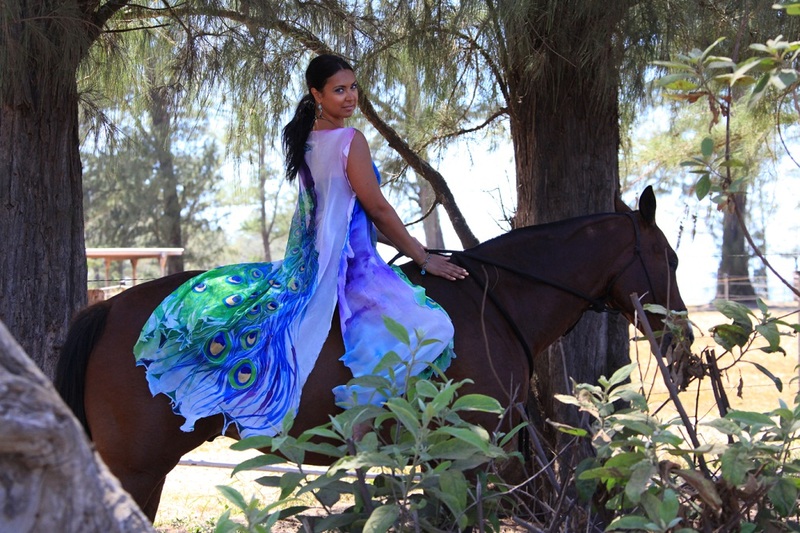 We have also developed a line of hand painted, luxurious silk wedding gowns. Since women dream and visualize their wedding day as the most extraordinary and special day and as the beginning of their new lives filled with LOVE, PURITY and BEAUTY, Violet Luck’s unique business model meets the emotional needs of that woman and makes her biggest dream come true by creating for her a one-of-a-kind hand painted and designed silk wedding gown. No one else in the world has her piece of ‘art garment’. It is signed by the artist and numbered as a collector’s item. The bride chooses the theme, colors, the art - her imagination has no limits as the artist has no limits in her creations. An added benefit is that all the garments can be worn over and over again. It is not a one day garment and therefore becomes a memorable piece that will carry on the special moments, beauty, and uniqueness every time it envelops the body.